Full Tilt Poker continued to expand on its impressive roster of pros, signing the engaged couple of David Benyamine and Erica Schoenberg to a sponshorship deal. This deal will presumably be similar to other deals that Full Tilt Poker has given out: a number of paid-for buyins to big events, 100% rakeback to the pro and a bonus everytime the pro appears on TV wearing Full Tilt Poker gear. David Benyamine is a well-known high limit cash game player. You have undoubtedly seen him on Full Tilt Poker and Pokerstars if you rail the high limit games. Benyamine has a number of different online aliases, including "magicpitch" and "ballsrider." 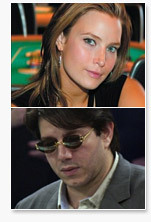 Under this new deal with Full Tilt Poker, he will know be exclusively playing under the "David Benyamine" alias. Erica Schoenberg is a known professional poker player as well, having gotten deep into the money at numerous different poker events. Schoenberg and Benyamine are happily engaged to each other. Benyamine is a great No Limit Hold'em player and an absolutely lethal Pot Limit Omaha player. When you include all of his different aliases, Benyamine is up millions on Pokerstars and Full Tilt Poker in 2007.